The world’s oldest Cornish pasty maker, pierogi made in Hereford and discounted BBC Good Food Show tickets all feature on this week’s Table talk menu. Kenilworth is set to welcome a new bakery, which will open on Thursday 5th April in the Talisman Shopping Centre. Warrens Bakery is proud to be the oldest bakery in Cornwall and recognised as the world’s oldest Cornish pasty maker. As well as award-winning pasties, the new Warrens Bakery store in Kenilworth will offer freshly baked bread and cakes. The Food Programme’s Food and Farming Awards finalists have been revealed . They include the Old Granary Pierogi from Hereford who are one of three food businesses in the Best Streetfood and Takeaway category. Winners will be announced later in the year. Looking ahead to the BBC Good Food Show in June, they are offering an egg-cellent 25% off standard adult tickets purchased this weekend. Quote EGG when booking, offer valid until Tuesday 3rd April. The Wild Shropshire pop-up has found a permanent home. From Friday 2nd March James Sherwin and his team will be delighting diners from Ternhill Farm House, a beautiful Grade II listed Georgian property near Market Drayton. Wild Shropshire will have a weekend residency, serving a multi-course tasting menu with the option of a matching wine flight. What used to be a branch of Natwest on Warwick High Street is being converted into a coffee shop and wine bar. Jack and Alice already has two other branches, but this will be the first for the Midlands. The new venue will be open daily for coffee and breakfast, afternoon tea and cake, then wine and cheese in the evening. Diners in Kenilworth have an opportunity to enjoy three Michelin-starred fine dining, when Jacques Marcon, head chef at Régis et Jacques in France, will make special appearance at The Cross. On Thursday 8th and Friday 9th Marcon will join Adam Bennett’s brigade to cook a six-course lunch and a seven-course dinner. The latest news from Lasan, The Steamhouse Company, Restaurant 23 and Patina in this week’s table talk. 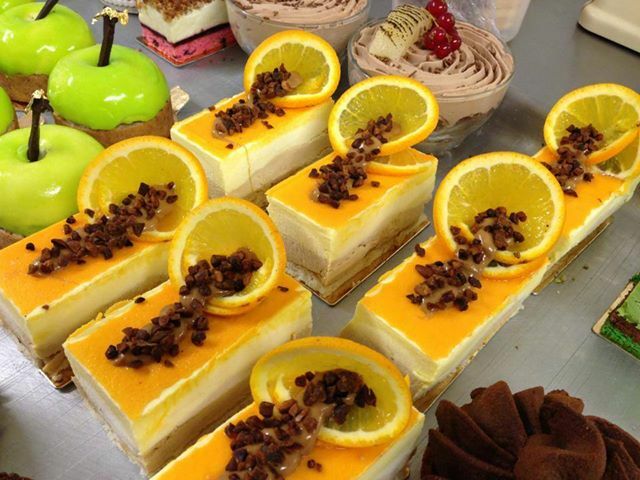 Lasan in Birmingham has closed its doors – but don’t worry its only temporary! The restaurant is being refurbished and a more spacious interior plus new menu will be revealed in October. Steamhouse, the coffee and bagels café in Leamington, has expanded and opened a new branch in Stratford upon Avon on the High Street. Restaurant 23 in Leamington has welcomed Abigail Connolly to the team. Abigail is taking over from Eduardo Neto as Restaurant Manager and Sommelier. 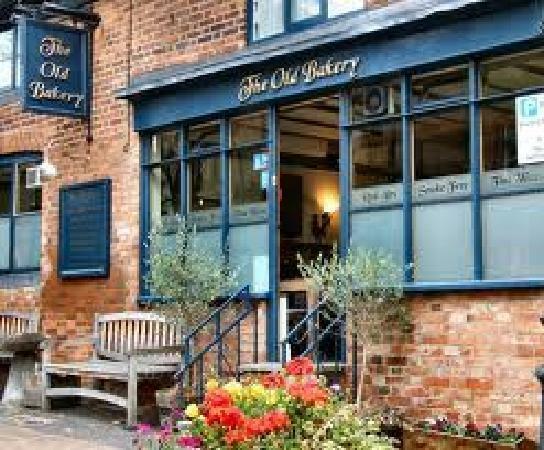 A new bakery has opened in Kenilworth. Patina is owned by Amy Clarke, who was previously pastry chef at The Cross. Ingredients used for her wedding and celebration cakes come from fair-trade sources and often local ones too – with flour from nearby Charlcotte Mill. 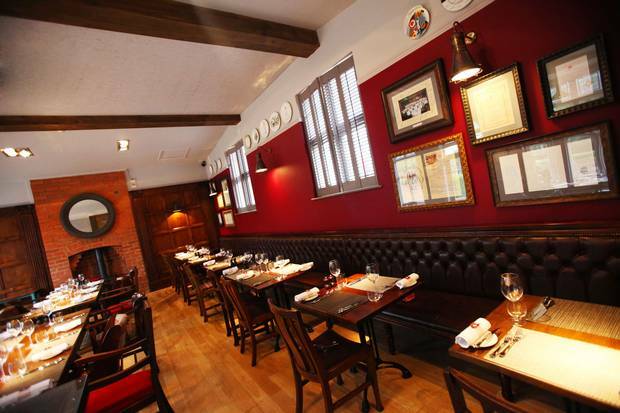 Kenilworth’s popular gastropub The Almanack is serving a new menu that you can tuck into from noon till 10pm. Head chef Jakub Fijak’s dishes include free-range flat iron chicken and skinny chips, classic smoked haddock fish cakes with soft poached egg, slow roasted Cornish lamb shanks, pan-fried scallops with pork croquettes and the grilled Cornish mackerel with warm potato, red onion and cucumber salad. 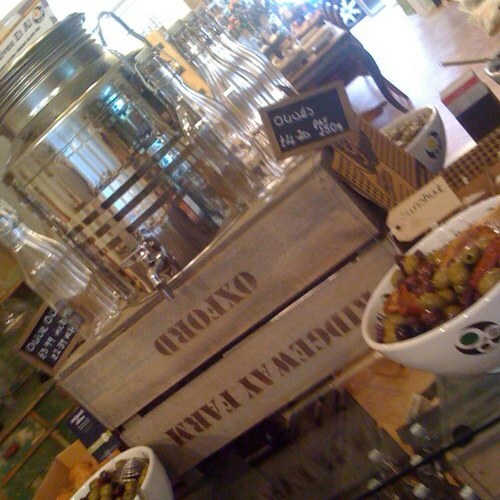 He’s also put together a collection of small pots for mixing and matching to make up your own tapas. Think British-style deli pots – smoked mackerel pâté with soused cucumber; sesame-crusted halloumi with peanuts and Blythbrugh pork croquettes with apple sauce. You can also enjoy £15 off when you dine any weekday before 10th February, just quote ‘New Year’s Treat’ when you book at The Almanac. Apart from the deli boards at The Almanac and cocktails at The Kenilworth, I’m always at a bit of a loss at where to go to eat and drink in Kenilworth. The Cross is spectacular, but not an everyday venue, so I’m hoping that the opening of Number 11 Restaurant may help bridge the gap between snacks and full blow-out Michelin star meals. The former Beef restaurant on Warwick Road has been given a makeover by the new co-owner chef Amir Dilba. 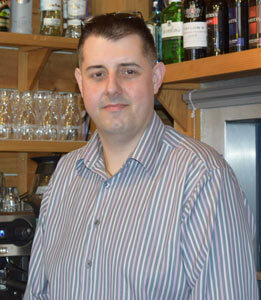 Amir was born in Leamington Spa and worked with the brigade at Mallory Court before becoming Head Chef at Beef. Last year the opportunity to buy Beef from Andreas Antona came up, so Amir and restaurant manager Shireen Sabedien siezed the chance to open their own restaurant. 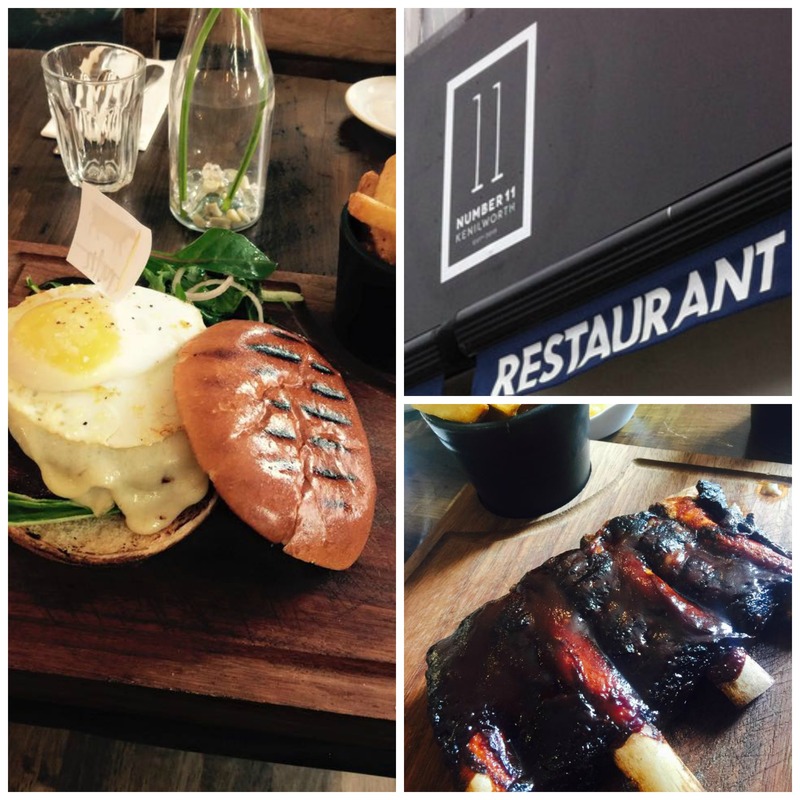 Number 11 will open for brunch, lunch and dinner from Monday to Saturday. Diners can expect a relaxed, friendly, neighbourhood restaurant serving brunch classics such as eggs Benedict and more restaurant style dishes such as scallops, black pudding, pancetta and pea purée. Burgers with all the trimmings start at £9.50 with beef cuts at £14.50 and an early bird midweek supper of two courses for £15.95. Number 11 Restaurant opens this weekend and I wish Amir and Shireen the best of luck with this new restaurant in Kenilworth. A Delish Deli takeover, my top ten places for National Afternoon Tea Week, Kenilworth destination guide, four fab farm shops and a guest post from Ahmed Ahmed on the Birmingham Independent Food Fair are all new features that I will be working on for the blog. You can follow the blog to receive updates or find me on Twitter @midlandsgourmet for updates. 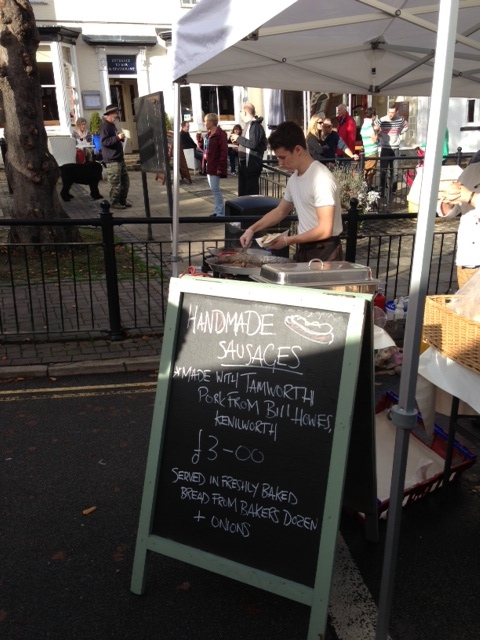 Last weekend was the end of Foodie Fortnight, which coincided with Oktoberfest, so Kenilworth High Street was closed to traffic and filled with food stalls and live music. The little street was packed with locals enjoying a pint outside The Virgins and Castle pub. This is one of the oldest pubs in Warwickshire, built in the late fifteenth century and first used as a pub in 1563. 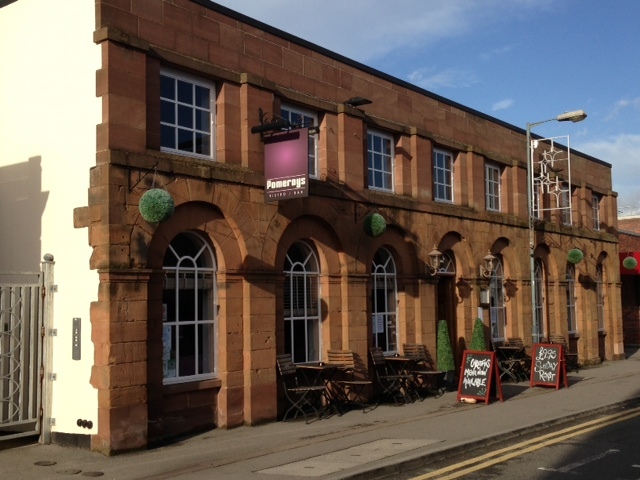 As well as the historical background this pub is a popular attraction as they serve Filipino food, using fresh local ingredients. 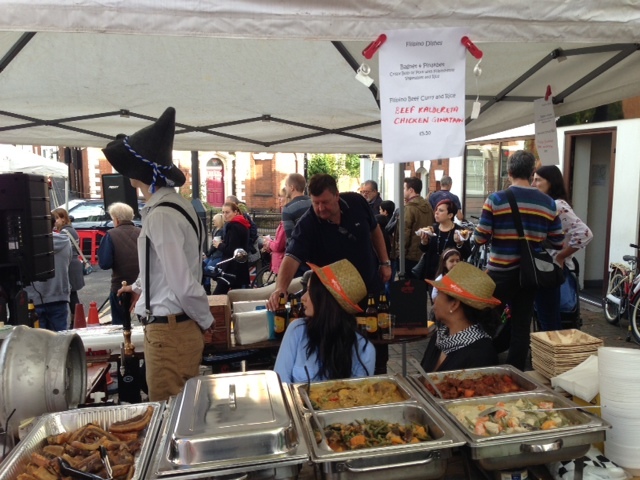 Their stall was serving crispy belly of pork with Filipino style vegetables and beef curry. On their regular menu, I liked the sound of chicken and pork adobo – slow cooked chicken and belly of pork marinated in soy sauce, cane vinegar, garlic and peppercorns. We had a quick drink in The Old Bakery the cosy oak-beamed pub a couple of doors up from Loch Fyne, before we walked into the town centre to do some food shopping and eat. The parsnip and cheddar croquettes from the veggie sharing board are one of my favourite things about The Almanac. This gastro pub is part of the Peach Pubs family and serves food all day, but we walked past enroute to Pomeroys Bar and Bistro for brunch. As my partner demolished a full English breakfast I went for a lighter avocado, mushrooms, tomato and poached egg on toast. He liked the high backed booths and relaxed atmosphere and wanted to come back for dinner, but we had shopping to do first. We finished our afternoon with coffee and cake in the cherry red Ardens coffee shop. As part of the Kenilworth Pudding trail they were selling fresh scones with jam and cream for a bargain £1, which we couldn’t say no to. 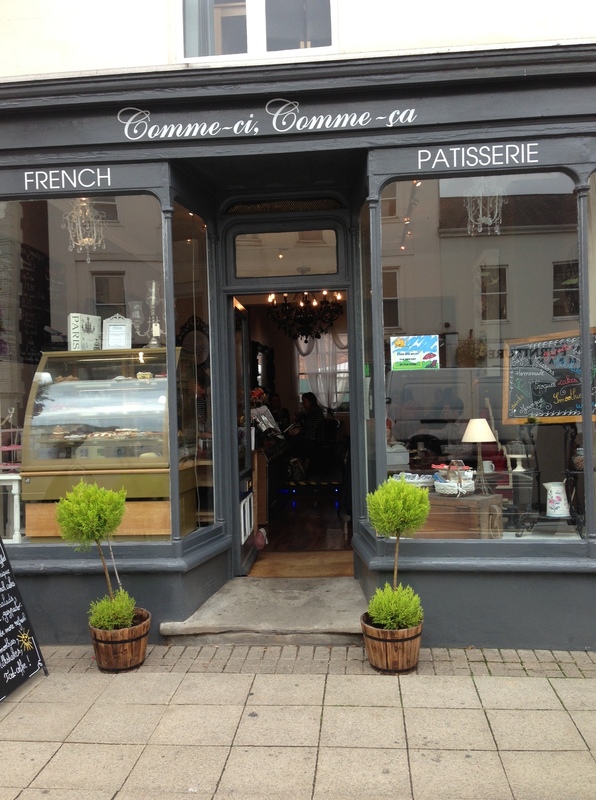 The residents of Leamington are already spoilt with two shops from French patisserie Comme-ci Comme-ça (Warwick Street pictured below) and now it’s Kenilworth’s turn to be delighted by their amazing confections. 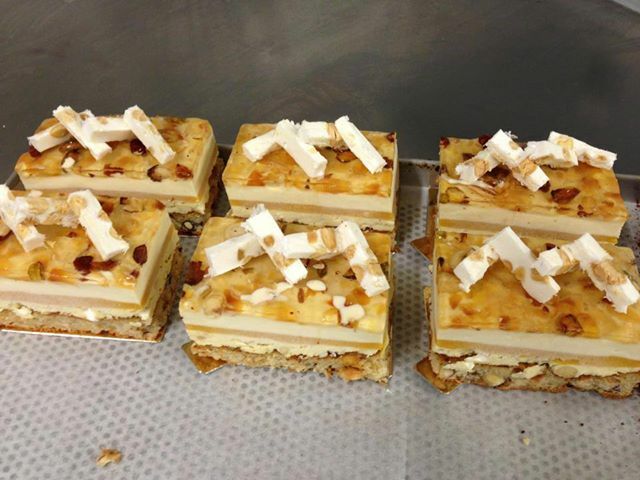 While I was in Leamington last week I bought a passion fruit and coconut tart, plus one of the new Le Montelimar’s – an apricot and nougat cake, layered with fruit puree and mousse, which were absolutely divine! I’m going to let the images of their gorgeous cakes do the talking for them. Coventry-born Matt Palmer, who has cooked with some of the top chefs in London including Michel Roux Junior at le Gavroche, has returned to his roots and joined The Almanack in Kenilworth as head chef. 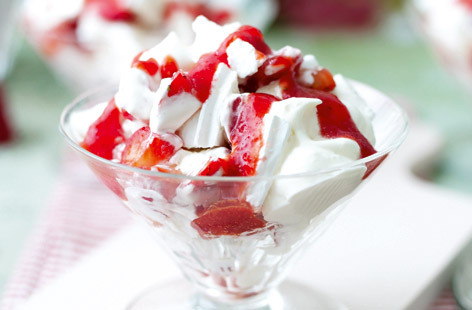 At the moment, his version of Eton Mess, or Eton Tidy as he calls it, is becoming a star on The Almanac’s menu. It’s an empty glass bowl on a board with a selection of Evesham strawberries, raspberries, home-made meringues and Chantilly cream in separate bowls. You dip into the bowls to make your own personalised version of this great British classic. So you can max out on the fruit and go easy on the meringue, or toss the whole lot into a bowl and mix it up just as you like it.